Cypriots protest against the EU bailout, which would require a one-time tax on bank deposits. 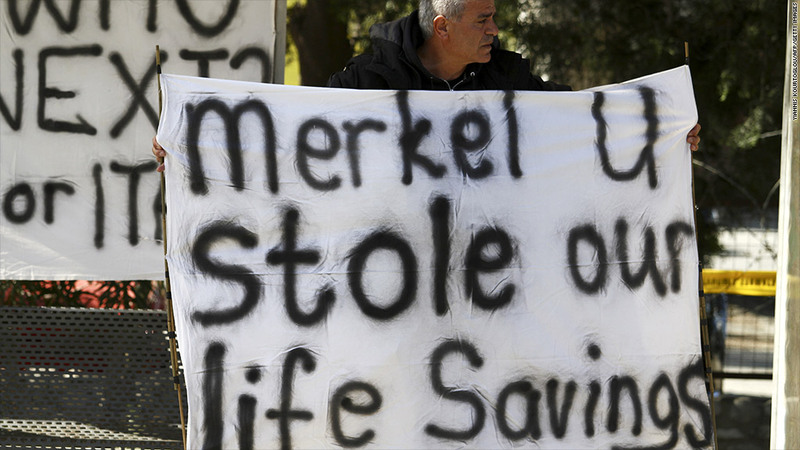 The latest European bailout is blowing up. Two days after the European Union revealed a €10 billion rescue for Cyprus, the tiny island nation said its banks would not reopen at least until Thursday to give it more time to win the backing of parliament for a controversial tax on deposits. The unprecedented tax on bank deposits led to a run on cash machines in Cyprus over the weekend. It also spooked investors, who feared that other weak eurozone states could eventually be forced down the same path, despite EU statements to the contrary. Shares across the region fell Monday, and banks were hit particularly hard. The prices of government bonds across southern Europe also fell, pushing up yields. There were no signs of bank runs in other European countries, including Italy and Spain. "The contagion from Cyprus is fairly limited but there is a tail risk that this measure could backfire," wrote Berenberg Bank analysts in a note. As part of the plan to rescue Cyprus' outsized banking sector and head off national default, the EU said deposits of more than €100,000 would be subject to a one-off levy of 9.9%. Smaller depositors would be subject to a levy of 6.75%. It was the first time that the EU has insisted on such terms for bank depositors as part of a bailout. The EU's bailouts of other nations, such as Greece, have been accompanied by strict budget restrictions and led to losses for bond holders and shareholders. Parliament had been due to vote on the plan Monday -- a bank holiday in Cyprus -- with the tax due to take effect Tuesday. But officials were working on changes to the proposals to force richer savers to bear a bigger share of the cost, reducing the burden on those with less than €100,000 in deposits. The speaker of the parliament confirmed that the debate had been delayed until Tuesday, with a vote tentatively scheduled for midday ET. After an emergency meeting on Monday, eurozone officials generally stuck to their guns. The reform plan approved on Saturday "is the best guarantee for a more prosperous future for Cyprus and its citizens," EU officials said. The EU officials also said they would endorse a change to the original bailout plan that shielded small bank customers more than the proposal. Either way, analysts said the levy set a dangerous precedent and could undermine depositors' belief that their savings are safe. "The Cyprus deal may prompt Europeans to question that," wrote financial markets analyst and blogger Louise Cooper. "A fundamental safeguard to Europe's banking industry has been compromised for a tiny country costing 10-20 billion euros to bailout -- not a good trade." The bailout, while small compared to the emergency loans supporting other troubled European nations like Greece, represents more than half the size of the €18 billion Cyprus economy. Cyprus is the third smallest economy in the eurozone, bigger only than Malta and Estonia. The problem is its banking sector, which is several times the size of the economy. The country made a formal request for help last June after its banks were decimated by losses on Greek debt -- losses that caused lending to stall and sent the economy into a deep recession. Negotiations on a bailout stalled last year after a previous government objected to the conditions that international lenders were looking to attach. They restarted following the election of President Nicos Anastasiades last month. EU concerns about money laundering also hampered progress on a bailout. Cypriot banks have large volumes of international deposits, with Russian businesses believed to hold about $19 billion, according to ratings agency Moody's. As part of the bailout deal, Cyprus has agreed to an international anti-money laundering audit. Russia has come to Cyprus' aid in the past, providing a €2.5 billion loan in 2011 to shore up government finances, but its participation in the new rescue was looking uncertain Monday after President Vladimir Putin attacked the tax on bank deposits. "If such a decision was made, it would be unfair, unprofessional and dangerous," Putin spokesman Dmitry Peskov was quoted as saying. In addition, a finance ministry spokesman said Russia was reviewing its position after not being consulted on the decision to impose the levy. The International Monetary Fund was expected to contribute to the deal as it has in others. Christine Lagarde, the fund's managing director, said Saturday that she supports the terms and would recommend that the IMF help provide financing for it. In addition to the tax on bank deposits, other conditions for the bailout loans include an overhaul of the financial sector and an increase in corporate taxes. -- CNN's Elinda Labropoulou and Charlie Charalambous contributed to this article.